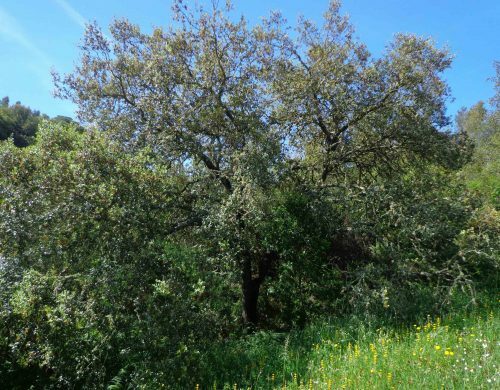 The Holm Oak, or Azinheira as it is known in Portugal, is a slow growing, sprawling evergreen oak. When it has space, its branches spread wide and low. It is resilient and drought resistant. It is a prolific producer of large acorns which are sometimes sweet and can be eaten like chestnuts without having to leach out the tannins. 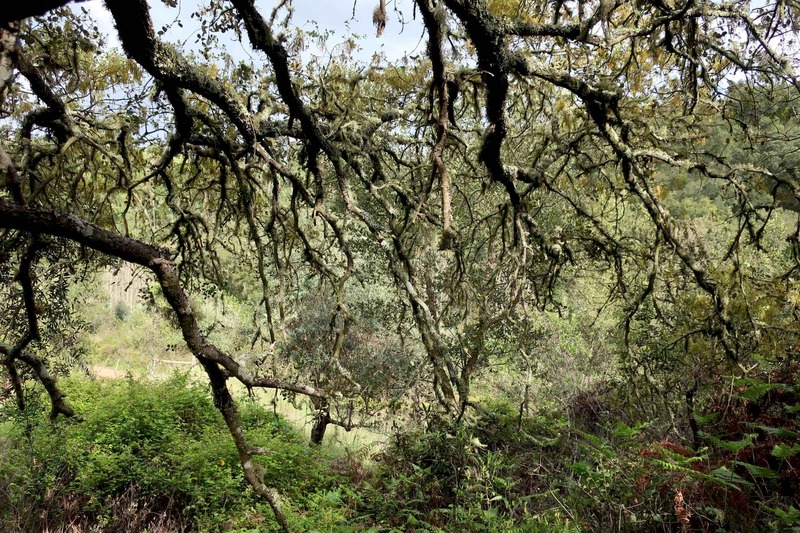 In the Alentejo, pigs are sent in amongst these oaks when the acorns lie on the ground to fatten them up. The tree also provides protective shade for people and animals in the hot Alentejo summer. And provides the best slow-burning logs for the fire. I start making the essence quite early on a hot May morning, welcoming the shade of this tree hidden at the bottom of the dam. All around is a meadow of tall grasses, lupins, clovers and other wild flowers – a sea of colour. Its hard to find a place to set down the water bowl where it will not get shaded by the grasses. The tree’s energy feels grounding and nourishing, offering stability and sustenance. Its wide branches are like arms spreading wide to embrace me, drawing me in. 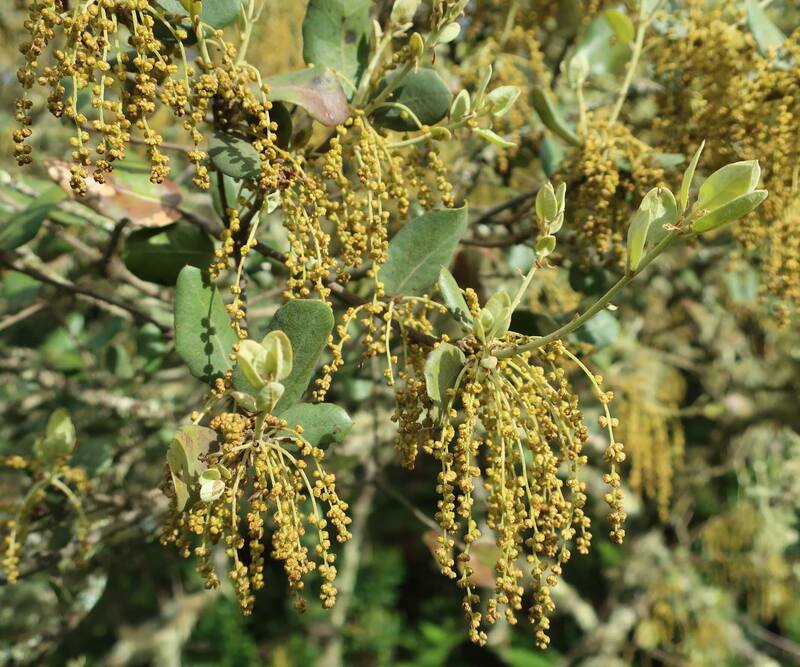 In contrast, the Holm Oak flowers are clusters of delicate hanging yellow-green droplets, quivering in the breeze. The branches of the tree reach downwards to meet the earth, creating a cool dome-like refuge. It has the feeling of a strong mother, and on a spiritual level invites us to rest in our own “inner cave”. The energy is yin – drawing from outer to inner, from above to below. 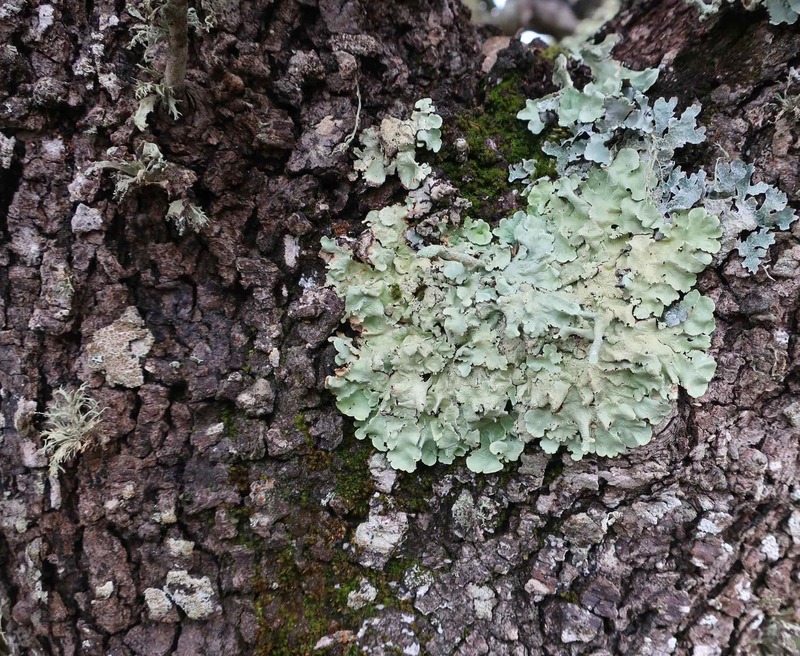 These spreading branches often break off as they bow down out of the sides reaching towards the ground. This reflects its supporting energy for letting go of what no longer serves us, so we can be centred in our core and adapt smoothly to change. I sense how in times of scarcity it has assuaged hunger with its generous acorn fall. As the oak leads me deeper into myself I can feel its unique offering of wisdom. I feel its roots rooting me into my stable core and from here a channel opens up from my heart centre to the tree, and I feel information passing into me from the tree. A download. I feel held by the earth, I am allowed to rest, calm, in the knowingness of my being. By the time I remove the flowers from the water, it is almost midday and hot. The mother essence is yellow in colour and sparkling in the sun. I feel this essence will be good for addressing weakness, floatiness, wavering, too much movement, and can be an aid for going inwards and for meditation. It teaches how to nourish and mother oneself on all levels. It invites is to notice what is on the ground / under the ground and to become rooted and grounded on the earth. If supports one to find stability during times of change or upset or trauma.